систематизация и обобщение знаний учащихся по теме. Развитие коммуникативных навыков по теме “Экологическая проблема”. формировать уважительное отношение к природе, бережливости, осознание роли человека во взаимодействии с природой. формировать способность ососзнать экологические проблемы и желание помочь природе. поддерживать других и быть к ним благожелательными. способствовать развитию аналитического, критического, материального мышления через использование проблемных ситуаций. С учащимися восьмого класса была проделана работа в вопросно-ответной форме. Перед началом урока ребята изучили слова, словосочетания на английском языке, связанные с экологией и окружающим нас миром. Ученики во время урока ведут беседу в группах о понятии “лес”, представляя этот термин для тех, кто впервые задумался над ним. Затем восмиклассники обобщают свои ответы и каждая группа рассказывает о важности леса, о том, что дает лес людям и для чего он жизненно необходим. The Earth needs a friend, dosen’t it? Good morinig, dear children collegues, guests! Today we are going to have a talk and discuss the environmental problems. You are just one of 7,000000000 million people, who live on our Earth. So can your actions really make a difference to its future? The answer is yes, they certainly can. Because if you try to live in a way that will save the world rather than destroy it, you won’t be alone. Your example will encourage your friend and family to do the same. Then they will tell their friends and families helping to care for the environment. 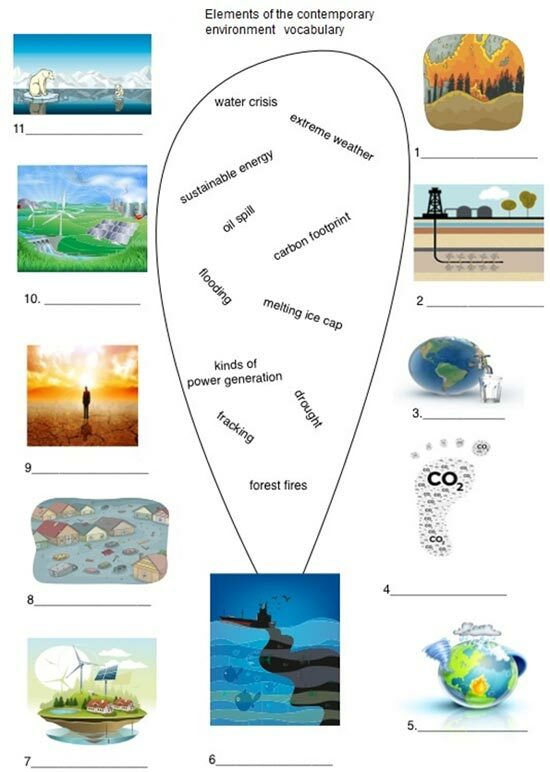 These exercises are introducing and exploring academic vocabulary for environmental issues in the classroom. 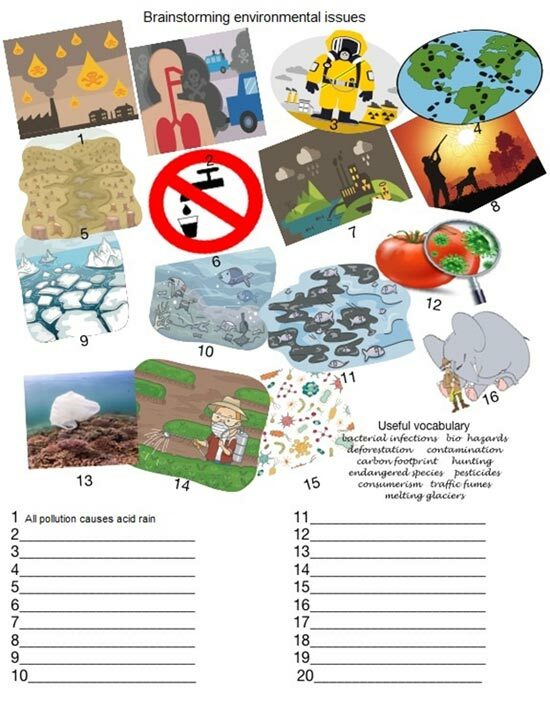 You must fill out the worksheet or match the vocabulary to the pictures. Now,children let’s revise the words and expression,phrasal verbs,prepositional phrases,word patterns we need. Let’s imagine you are on another planet. The people who live there have never seen a forest. How would you introduce / describe the forest in general. Forests are essential for life on earth. Three hundred million people worldwide live in forests and 1.6 billion depend on them for their livehoods. Forest also provide habitat a vast array of plants and animals many of which are still undiscovered. They protect our watersheds. They inspire wonder and provide places for recreation. They supply the oxygen we need to survive. They provide the timber for products we use every day. Doctors are prescribing forest walks. Trees save lives. They clean polluted air, improve symptoms of asthma and looking at them even helps post operative recovery time. Walking among them stops self - obsorption and anxiety. After two nights in a forest our levels of “killer” white blood cells ( that attack infection and tumours ) soar by 50 per cent. The heart rate is also lowered. Approximately 10% of todays drugs derive tropical medicinal plants. Three thousand plants have anti-cancer properties and 70% of these are to be found in tropical forests. Medicine from trees, extracted from the food, bark, roots, leaves, flowers, fruits or seeds is fundamental to the well-being of millions people. Nature and the Romantics have a close intertwining relationship. The passions of men are incorporated with the beautiful and permanent forms of nature, that the mind of man (acts as)the mirror of the fairest and most interesting qualities of nature and this reflect his feellings on the subject nature and men are tied together with force that cannot be broken. Trees are as much important to our life as food and water. We can say that life would be finished because trees are most important of giving us healthy and wealthy life. Trees give us life directly and indirectly as they are source of oxygen production,CO2 consumption and source of rain. They are most precious gift to the humanity on the earth from nature for which we must be grateful, give honour and preserve for the mankind wellness. Save trees, save life is not only a slogan, it is a responsibility which should be followed by each and every person living on the earth. It is a big opportunity to all of us to save our healthy environment and green earth by saving trees. Trees are symbol of life on the earth and natural home for many people and wild animals. Saving trees have been must at any cost in such a modern world where urbanization, industrialization and global warming is going very fast. In such a technological world, where people are fighting and working for themselves only, only trees are living for benefiting others ( human beings and animals). Let’s mention some importance and precious value of trees which will help us to know why trees are called as green gold on the earth and most important for the healthy life. Trees in the society, community, streets, parks, playgrounds and backyards play great role in providing cool shadow during our outdoor activites. They are good source of absorbing and rainwater thus prevent from harms after of plants. Trees have their personal and spiritual value as they animals. Birds make their nest on the trunk of plants. Trees have their personal and spiritual value as they look colorful and very beautiful. Some of the trees are traditionally worshipped by the people from ancient time. They are source of economy for many people as they are used commercially as a fuel, building construction, tools, furniture manufacture, sporting, household items, paper and so many purposes. In conclusion forests are very necessary for us and our future generations to enjoy and live a healthy and peaceful life in the healthy environment free of pollution.